Vertical, lateral, roll-over and roll-up : chose the best durable, ergonomic and safe solutions. Rafflin Alu & PVC has selected different ranges and collections of garage doors, which will match your home comfortably. The products are available in several colours with or without drawings and can optionally have a custom coating to satisfy your needs in terms of design and architecture. Our wide choice of systems will meet your needs, considering the criteria of space, security and comfort, both in the case of new construction and renovation. Vertical or lateral, manual or motorized, sectional doors offer an undeniable space saving on the wall side or on the ceiling and fit perfectly with any kind of opening: rectangular, oblique or curved. With a very easy engine to maintain and almost silent, this product provides a significant gain of space on the ceiling. Available in standard and non-standard models. These doors combine quality and technical strength with a long durability. 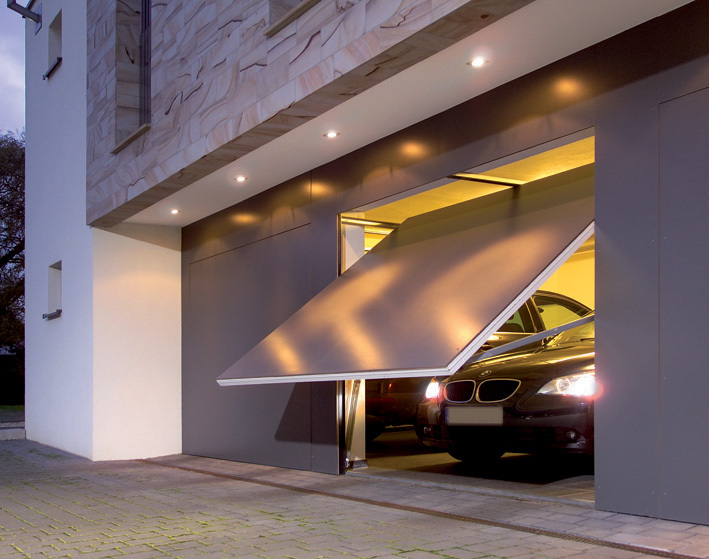 Steel garage doors : Perfect solution for solid doors of all sizes and mostly suitable for roll over and sectional formats. PVC garage doors : Wide choice of opening doors, sliding and folding in construction and renovation. Economic and with easy maintenance. Wooden garage doors : Used primarily for renovation and replacement of opening, sliding and folding doors. 3A Class treatment (rot proof, fungicide and insecticide treatment) and water repellent.